Korzukhin Alexey Ivanovich is recognized as one of the most talented Russian genre artists. Unfortunately, art history did not take him seriously during his lifetime, although today his works are represented in various museums and are in great demand at exhibitions. 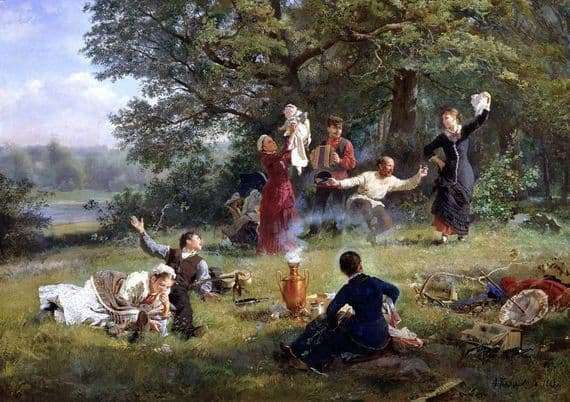 All his talent can be seen in the painting “Sunday Day.” The composition of the painting depicts one of the days of an ordinary Russian family. All its members gathered in the meadow, there are children and their nanny here. Baby in her caring hands and gentle hands, smiling and laughing. All of them have a great mood. The same reflects the state of nature, the sun shines clearly, warming the family. The coachman plays the harmonica cheerfully, father and mother dance merrily, raising the spirits of everyone present. In the middle of the composition is a boiling samovar. The family will soon eat and drink tea. The eldest son defiantly waves his hand in the dance of his parents. Near him is a lonely balalaika. The girl in the blue dress sets the table. Near the boy a girl in white, listening to music harmonium and smiling. In his “Sunday Day” striking composition of details. Here everything is traced to the smallest detail.